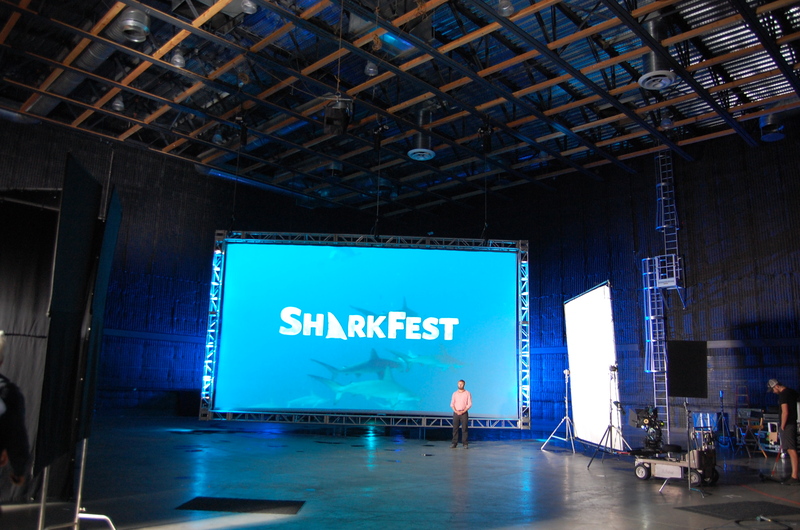 Celebrating Truth in Advertising: The SharkFest Rant. 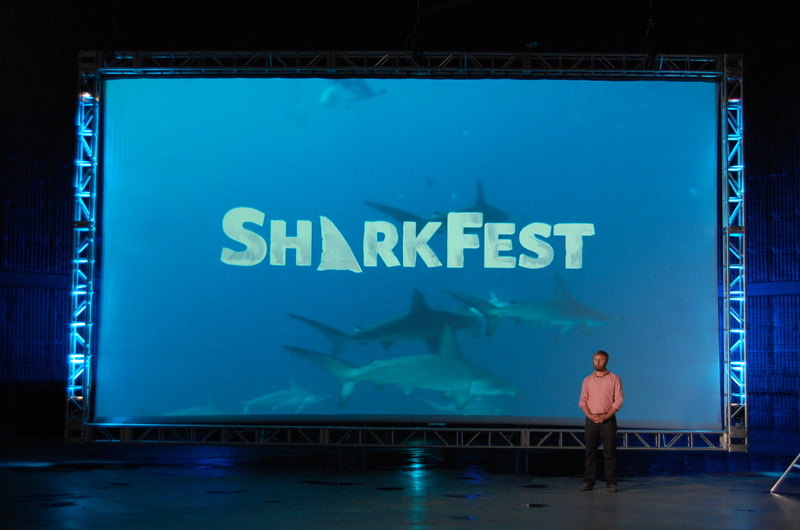 At NatGeo WILD, we recently released a new promo campaign for “SharkFest.” If you haven’t heard of SharkFest before, it’s similar to another network’s 7 days of shark programming in the summer, which is not-so-coincidentally on at the exact same time. This is the story of not only the making of the promo that Money magazine called “quite possibly brilliant” and Ad Week called “hilarious” but also the process of how we got to that concept in the first place. It was a long and winding road, so let’s get started! On-set, shooting with comedian Rory Scovel. Photo by Superlounge. We needed to do something simple and fun, that also demanded your attention a bit more. One thing that the “Shark Kill Zone” spot nailed (in addition to the high notes) was honesty. Don’t pretend to be something that you’re not – or at least, embrace what you ARE. In that particular show’s case – it was all about sharks eating stuff. Yeah, maybe there was a LITTLE science, but it’s “mostly sharks eatin’ stuff.” And that embracing honesty is what led us to The Rant. We then had to sell in the idea to our own internal ‘clients’ – and it didn’t take too much convincing when they saw the script and the attitude of the spot. After months of batting around idea after idea, everyone was on board with the rant idea and with trying to get Rory to be our guy. But we weren’t done yet – we still had to figure out who to work with on the production side. In a similar way that Tyler reached out to Rory, it immediately crossed my mind that Jordan Brady (of the production company ‘Superlounge’) could be a great potential fit as a director for this spot. We don’t do a ton of comedy spots at Nat Geo and while we had the concept, talent and script more or less nailed down before even going into production, we wanted to make sure that we had the right director to ‘bring it home’ and possibly enhance the idea even more, and increase the humor whenever possible. Jordan and I had worked together about 10 years ago for a big campaign for Nat Geo, and we loved working together then, and had recently re-connected when I did an episode of his “Respect the Process” podcast (check it out his podcast at JordanBrady.com, it’s got great production insights). He’s highly collaborative, funny, and knows how to get the most comedy out of an idea. Here’s a director’s cut for one of the spots we did for “Is it Real?” in that early campaign which I’ll never forget for it’s awkward-yet-funny way we approached the subject of Bigfoot. I always appreciated Jordan’s comic sensibilities, but also how he ran a set. He’s a big proponent of giving comedians space to be as funny as possible – and as a director that basically only does comedy spots, he would know how to make the most of our concept. I approached Jordan with the idea, unsure if we would even need an external director or not – and wanted to make sure that we were going to be hiring someone who would work WITH us, and not try to change things to put ‘their’ fingerprint too firmly on the spot. “It all starts with a solid idea – and this idea was rock solid” says Jordan. “If you have that, and then add great talent, your job as a director is easy.” He also respected the process and the fact that we’d already vetted a concept and weren’t looking for wholly new ideas. “Being a big fan of The Client Blog, I knew the rules of transparency and collaboration. Once we all got together and started riffing around with the possibilities, I knew we had something pretty unique here. 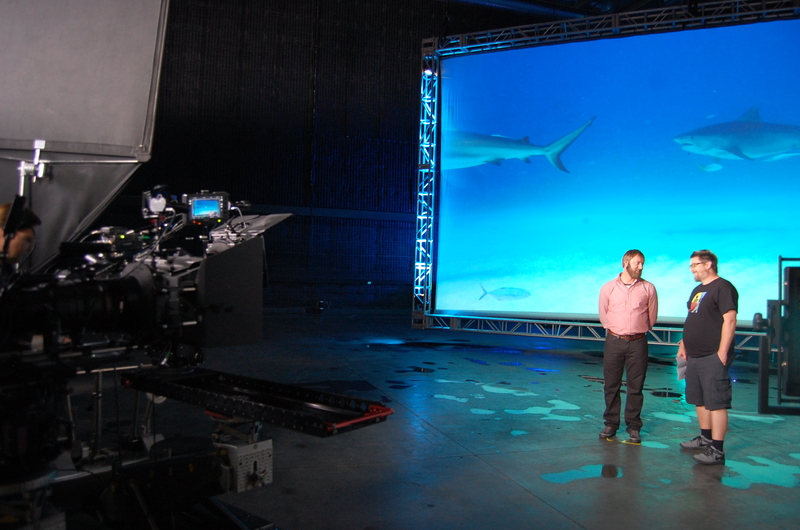 Everyone collectively was so buttoned up and excited to work together, it came together very fast.” Jordan quickly did a treatment, and one of his ideas was to build a set that felt almost “Patton-esque” – making the screen of projected shark footage super huge, and overpowering, as a way to show their supreme awesomeness as much as possible. His treatment included several different variations on the idea, but this one (which we had also discussed internally but maybe not quite at this scale for the image size) was the one that felt the strongest, and simplest. 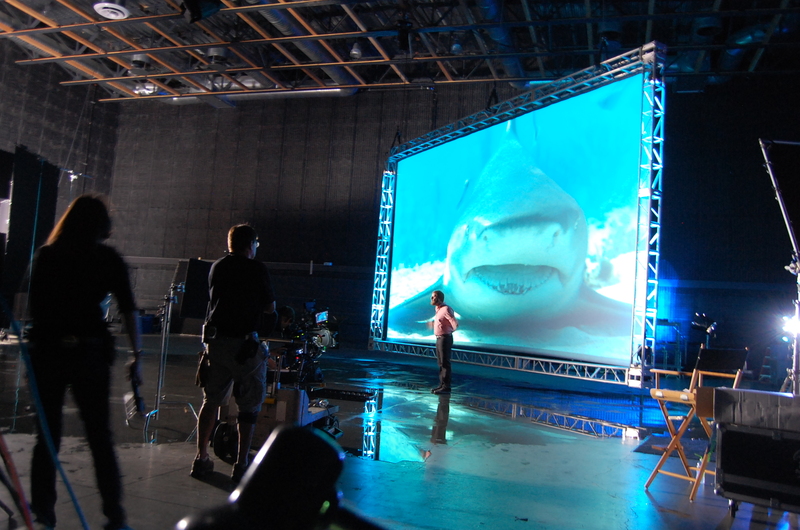 We also liked the idea of shooting it in an industrial space, with a nice wet floor to reflect that shark footage from the giant rear-projection screen. Having Jordan and his team in LA on the ground, they found a great sound stage, and once we had Rory on board, we were good to shoot in the first week of June – which was going to be tight since the promo was due to our press team with an initial release by mid-June. Director Jordan Brady chatting it up with Rory on-set. 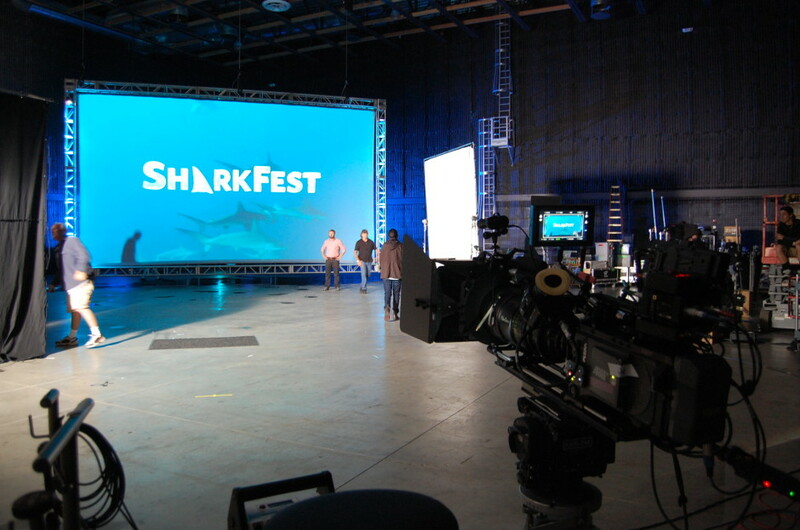 The gigantic screen and sound stage at Siren Studios. After a long and really fun day on set, James returned from LA, and got straight to work on edit. With the help of Nat Geo editor June Kim, they started cutting the first :60 that would be part of the press release. With so many jokes that could be mined from a full day of shooting with Rory, it came down to making choices. We had to establish that first – there is a thing, called “SharkFest” – and it’s on at the same time as another thing that seems similar. Then we had to make the shift to explain that we’ve been tricking you, the viewer, and you don’t really seem to notice…with tongue firmly in cheek, of course. And last, that even though we’re tricking you, please continue to watch us. OR, just watch us instead of ‘them’! Again, embracing the honesty, even if it makes you a bit nervous, was key. We did some back and forth on edits, removed some jokes that didn’t connect enough, and lengthened some jokes that needed more time – and it was clear we had the material, we just needed to make sure we were hitting those story beats clearly, and had enough jokes to keep it moving along. The best comedy spots in the world still rely on a perfect edit to deliver the jokes effectively. One other shift we made was in the music. Using an iconic “anthem” song helped make this feel like a bigger call-to-arms about our strategy, but it needed more depth and customization than the needle-drop music track we were using. We called up our friends at Clean Cuts Music to re-create the same track of music but to make it feel bigger, richer, and include stopdowns to accentuate jokes and moments. That quality improvement on the music front gave the spots that much more gravitas and customization that helped raise the bar even more. With those tweaks, it came together, and here is the final :60 piece. Once we had cleared the hurdle of that initial release of the :60, we held our breath to see what people thought. Promax Daily Brief put up a nice piece about it (read it here) and soon it began to catch on a little bit. Emails from folks in the creative community started coming in, congratulating us on our honesty and humor, and there was tremendous response on twitter as well as the spot started to circulate. James and June (along with sound mixers Grahame Davies and Nick Anderson) quickly cut together more spots to fill out the campaign with new jokes on the same theme – and you can see how the footage that James had cut before the shoot was used in different ways on the shoot day. We were a little surprised and flattered when the spot started to get some serious pickup – first with AdWeek’s review/coverage of the spot, then Money Magazine’s glowing review, as well as pickup by several other blogs, and even Reddit! It has been a fun ride, and this whole process reminds me that while we all talk about “taking risks” in marketing – sometimes it’s hard to pull that trigger and really put something out there that is a little more honest, a little more real. But that’s what people loved about this spot. Yes, it’s funny – “sharks can’t physically bow”, and “can’t sign exclusive deals with a network” – that’s all true. And funny ALWAYS connects with viewers (when it works). A big thank you to not only everyone along the approval chain who approved the concept and took a risk, but also thank you to my incredible team at Nat Geo. It was concepted, written, edited, mixed and designed by our internal team, and James Introcaso, who found a whole new way to promote SharkFest in this, his third time around on the project. And a huge shout out to Jordan as well, who did exactly what we’d hoped. To run with the concept we brought to the table – he didn’t try to change it, he just wanted to help bring it to life, and put the best possible team in place to do just that. As James puts it, “Jordan was the ultimate collaborator, including me in every decision and constantly supplying suggestions and tweaks to the copy to make it as great as it could be without losing the message of the spot.” And of course, a massive thank you to Rory Scovel, who brought his incredible talents to this project and exceeded our expectations. If you want to hear from Jordan and James, check out this podcast episode that they recorded directly after the production wrapped up. It’s got great insights on the project, how to become a TV Promo Producer, the Nat Geo team’s creative process and how to correctly pronounce James Introcaso’s name. Enjoy! And the capper was an actual segment from the Today Show – and not the Hoda and Kathy Lee Today Show Hours – this is from the MATT LAUER HOURS!!! I like it. I am not a comedy person, so I can’t appreciate a good joke. However I think the shark footage, the delivery of the jokes and the information the lines provided really informed the viewer. It kept the viewer entertained and it build excitement. I loved Rory Scovel’s delivery, he was excellent, clear, with a passive attitude, but not dismissive, and the his delivery moved towards and exciting closing. Good work. *and his delivery moved towards an exciting closing. there’s a thousand things right about this campaign. the killer imagery. the humor that comes from honesty. so much great stuff. but can I say… that massive rear-projection screen is INCREDIBLE. yall built a real massive screen rather than taking the easy/cheesy way out and going greenscreen. (and the wet-down floor is a super bonus!) huge props.